Specific characteristics of sport disciplines require their performers to meet certain demands, also those related to body build. A success is conditioned, among other things, by the morphological structure of competitors. For this cause, their somatic features should be taken into consideration in the selection process. The aim of this research was to describe the level of morphological development and body proportions of swimmers in comparison to their non-practicing peers. What is more, different methods were used to evaluate body tissue composition. The research was based on the measurements of 33 swimmers and 36 non-practicing sport males as a control group, with the average training period of 9 years. The subjects ranged from 18 to 23 years of age. The anthropometric features were examined. Two methods, anthropometric and bioelectrical impedance, were used to estimate the amount of body fat. Athletes performing swimming are characterized by the significant body height, long trunk, wide range of arms and highly developed shoulder girdle. Directed and systematic training has an influence on a great development of the upper part of the trunk and a slight decrease in body fat. The observed differences indicate that depth, circumference and mobility of the chest developed in swimming have a positive influence on the respiratory system. Poor differences observed in the amount of fat in the athletes and non-practicing subjects may result from the fact that the body accumulates fat tissue, used as a good thermal insulation. 1. Drozdowski Z. Antropologia sportowa [in Polish]. AWF. PWN. Poznań 1984. 2. Wieczorek W. Ocena prawidłowości doboru dzieci do sportu pływackiego [in Polish]. Uniwersytet Łódzki. Łodź 2001: 31-54. 3. Czabański B., Fiłon M. Elementy teorii pływania [in Polish]. Wydawnictwa Akademii Wychowania Fizycznego we Wrocławiu. Wrocław 1994. 4. Pietraszewska J. Zróżnicowanie morfologiczne zawodników różnych dyscyplin sportowych [in Polish]. AWF. Wrocław 1998. 5. Avlonitou E., Georgiou E., Douskas G., Louizi A. Estimation of body composition in competitive swimmers by means of three different techniques. Int. J. Sports Med. 1997;18(5): 363-368. 6. Bartkowiak E. Pływanie. Program szkolenia dzieci i młodzieży [in Polish]. Centralny ośrodek sportu. Warszawa 1999. 7. Sachnowski K., Oprychał C., Karpiński R. Wybrane problemy selekcji w procesie wieloletniego szkolenia. Sport Wyczynowy. 2005; 11-12: 224-227. 8. Lohman T.G. Skinfolds and body density and their relation to body fatness: A review. Hum Biol. 1981; 53: 181-225. 10. Lewitt A., Mądro E., Krupienicz A. Podstawy teoretyczne i zastosowania analizy impedancji bioelektrycznej (BIA) [in Polish]. 2007. 11. Carter J.E.L., Ackland T.R. Kinanthropometry in Aquatic Sports: A study of world class athletes. Champaign: Human Kinetics. 1994. 12. Karpiński R., Opyrchał C. Pływanie na Igrzyskach Olimpijskich w Pekinie – analiza poziomu sportowego, wieku i budowy somatycznej pływaków [in Polish]. Sport Wyczynowy. 2008; 10-12:7-23. 13. Avlonitou E. Somatometric variables for preadolescent swimmers. J. Sports Med. Phys. Fitness. 1994; 34, 2: 185−191. 14. 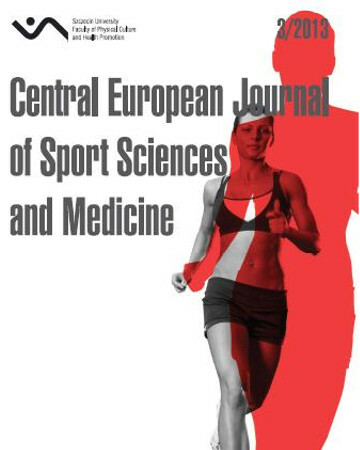 Benefice E., Mercier J., Guerin M.J., Prefaut C. Differences in aerobic and anthropometric characteristics between peripubertal swimmers and non-swimmers. Int. J. Sports Med. 1990; 11, 6: 456−460. 15. Marszałek A. Czynniki kształtujące tolerancje zimnego środowiska [in Polish]. Centralny Instytut Ochrony Pracy – Państwowy Instytut Badawczy. 2009. 16. Karpiński R., Sachnowski K., Oprychał C. Zmiany w szkoleniu pływaków najwyższej klasy [in Polish]. Sport Wyczynowy. 2005; 5-6: 57-67. 17. Stanula A., Cholewa J., Zając A. Body composition and chosen anthropometric variables in young swimmers. Annales Universitatis Mariae Curie-Skłodowska. Lublin – Polonia 2005; vol. LX, suppl. XVI: 224-228. 18. Vaccaro P., Clarke D.H., Morris A.F. Physiological characteristics of young well-trained swimmers. Eur. J. Appl. Physiol. Occup. Physiol. 1980; 44, 1: 61−66. 19. Malina R.M. Physical growth and biological maturation of young athletes. Exercise and Sports Sciences Reviews. Exerc. Sport Sci. Rev. 1994; 22: 389−433.